Higher education but at what cost? University education is a near and dear issue with most parents of high-school children. In Saudi Arabia, it practically borders on obsession as parents feel that only a college degree would validate their children’s education, and allow them to seek preferential employment. The children often have no say in the matter as they are pushed, rather than guided, towards such a course. And with the lure of the Kingdom’s scholarship programme that grants free college education, many students have jumped on the bandwagon. In the quest to obtain a college degree, some have hit roadblocks and have opted for an easier route. This was affirmed by a finding of the Ministry of Higher Education that has identified 110 offices selling forged degrees from non-Saudi universities. They had discovered that several agencies had been supplying bogus degrees to Saudi students for the past several years. It was also reported that the recent finding was just the tip of the iceberg, and that a special unit within the ministry had been formed to identify and list the bogus degree agencies. There has also been talk of getting tough and cracking down hard on all recipients of such fake diplomas. The degrees supplied by these diploma mills are not genuine or approved by any official body, and often not worth the paper they are printed on. They are issued by institutions that may offer courses without stringent controls or approved standards. Or they may be simply issued by the transfer of money into an overseas account. Fake college degrees can be a profitable business for those running them. 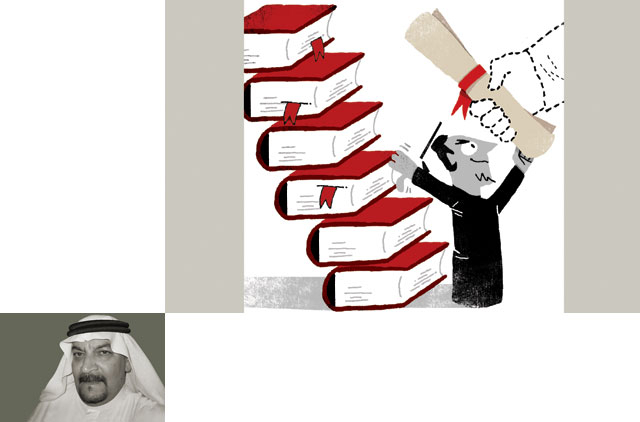 Prices for a fake bachelor’s or master’s degree can be anywhere from 3,000 to 30,000 Saudi riyals while a bogus doctorate degree can cost up to 90,000 riyals (Dh88,113) from an institution in the West. With the internet within everyone’s reach, the issuance of fake degrees has become a universal dilemma, and has made it easier for diploma mills to snare prospective candidates for bogus certification through fake ads or spam. Such institutions simply create a website that looks like it belongs to a genuine university. A US media investigative team reported that such sites would provide online payment options for customers as well as details for prospective employers who might contact them to verify whether a degree is genuine or not, and that bogus degree markets thrive in India, Israel and Egypt. Although there have been a few instances where students were genuinely unaware of the scam, in most cases it was reported that the prospective degree recipients knew exactly what they were getting into. A US Department of Justice finding of a few years ago created some ripples in the Kingdom when it named more than a hundred recipients of bogus PhD degrees in Saudi Arabia who obtained their certificates from such diploma mills. What was discomfiting was that some of them were holding executive positions in the government at the time, undoubtedly riding on the success of those fake degrees. This brings up another question. Do we need degrees for all our people? Is it the social trend that is creating pressure for one and all to seek a college degree? Those who are not earnest or committed enough or others who may just not be too bright in a university classroom may find the call of a diploma mill appealing. It requires only the transfer of money and very little mental effort on the part of a degree aspirant, and soon enough a snazzy and impressive piece of paper is in their hands sure enough to impress any human resources manager. There have also been a few cases where such degree holders were prompted by social pressure and not employment. Surrounded by a group of PhDs, they found it necessary to validate their standing among them, and the diploma mill was the most expedient method. I had written about this issue earlier as being a Saudi problem. But in my travels around the Gulf, I found that such a problem exists in neighbouring countries as well. GCC governments are generous in their stipends to nationals desiring to further their studies abroad. But, are all such nationals potential college or university material?